'Clayton', originally the Stephen Lloyd Bryce estate designed by Ogden Codman Jr. c. 1901 in Roslyn Harbor. Childs Frick, son of Henry Clay Frick, purchased the house c. 1918 and had Sir Charles Carrick Allom design alterations to the main residence while Guy Lowell designed the gatehouse. 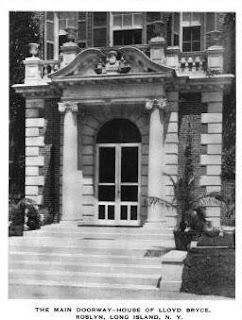 Today the estate operates as the Nassau County Museum of Art. Click HERE and HERE for more on 'Clayton'. Click HERE to see 'Clayton' on google earth and HERE on bing. Bryce's daughter Cornelia, married Gifford Pinchot and stylishly renovated 'Grey Towers' his family's house in Pennsylvania by Richard Morris Hunt. Those renovations included one of the black and white marble chimney pieces from Clayton, pictured in todays' post, and now in the library at 'Grey Towers' (sixth photograph in the link below). 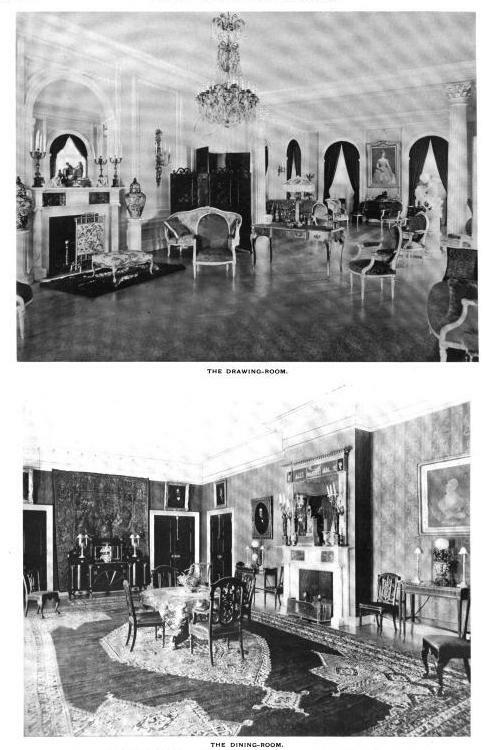 The chimney pieces, none of which are still in the house (not nearly lavish enough for the more luxe taste of the Fricks, one imagines), are clearly 1820s American, so one suspects they may in turn have been sentimentally salvaged from an ancestral home (so many of these little facts get lost with time), a very common occurrence in the day. Pinchot himself, of course was George Vanderbilt's first forester at Biltmore. Today's challenge for The Ancient: 'Clayton' of course is the name given the estate by the Frick family. For our bonus round, by what name, if any, did the original family, the Bryces, refer to the house? 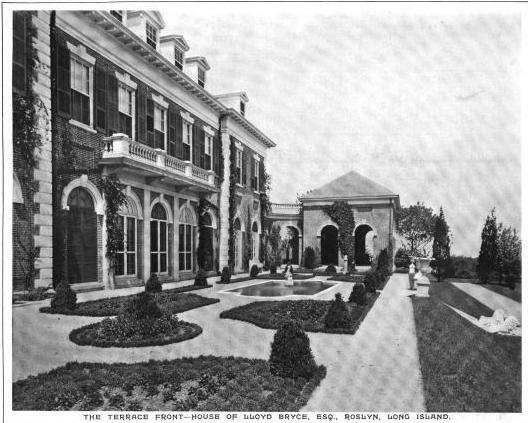 Just idle speculation, as I'm an idle sort of guy, but what do we think of the idea that maybe Lowell actually designed the exterior renovations on the main house also, as Allom was not an architect, but a decorator favored for his deft hand with high luxe? Just a thought. Sometimes, as we know from conflicting reports recently over at Beyond Gilding, information becomes corrupted and conflicting over the years. 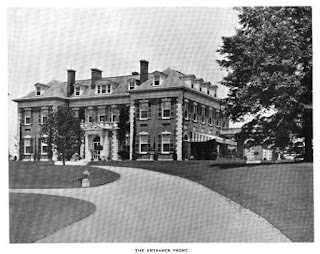 The family must've been rather enamored with the Clayton name to use it for their Pittsburgh estate as well as this on. 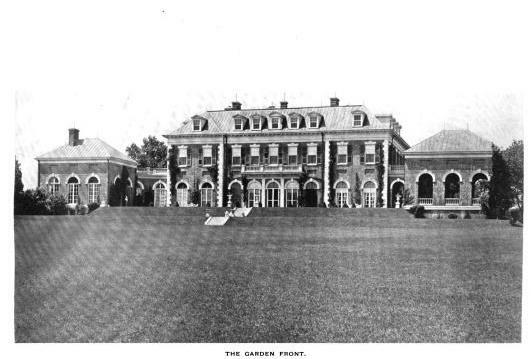 I wonder why Childs Frick's son, Dr. Henry Clay Frick II, would opt to not live in proximity to the family's estate there in Roslyn Harbor, but instead build in NJ. Had the area fallen out of favor for building new estates following the roaring 20's? Or more so because he attended Princeton for his undergrad? 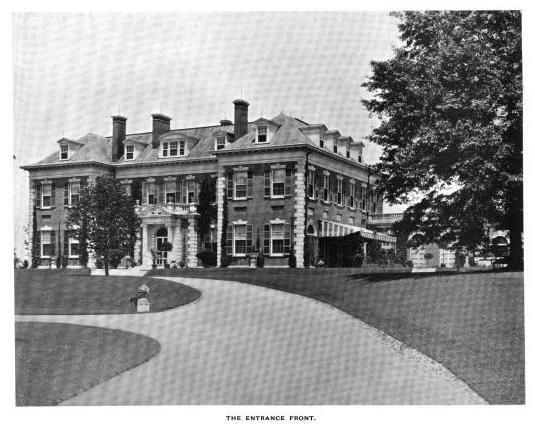 The late Dr. Frick's estate on the border of Alpine and Demarest, N.J., was built in the early 1930s and now is on the fairway of the Alpine Country Club. It's a very different animal that Clayton offered as a residence and home. 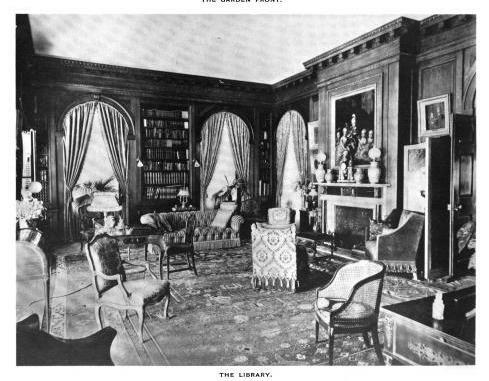 At the first photo I expected to see another Martin Hall in the interior. This one is decidedly more subdued.